Last year solar power saw unprecedented growth and it doesn’t seem to be slowing down. So where is much of this growth happening? In one word: cities. In a new report from Environment America Research & Policy Center and Frontier Group, Shining Cities 2016 identifies the urban centers fostering growth in solar energy, and the policies and programs that can maximize solar potential. The cities that topped the list were, not surprisingly, primarily from the sunshine-abundant Pacific region, followed by an equal amount of cities from the Mountain, South Central and South Atlantic regions. These centers of connectivity and growth are major electricity consumers, and therefore important movers in the transition to a clean energy economy. But there are still vast amounts of untapped solar potential in the U.S. – specifically 1,118 GW, which equates to 39 percent of total national electricity sales (enough to power over 782 million homes a year) – according to a study on “rooftop solar power generating capacity potential” by National Renewable Energy Laboratory (NREL). The same study stated that Los Angeles, the city currently with the most solar capacity, could host up to 42 times its current solar capacity, providing up to 60 percent of the city’s electricity. This staggering amount of renewable energy is possible in other cities across the U.S. as well – even in unlikely states, such as Texas. 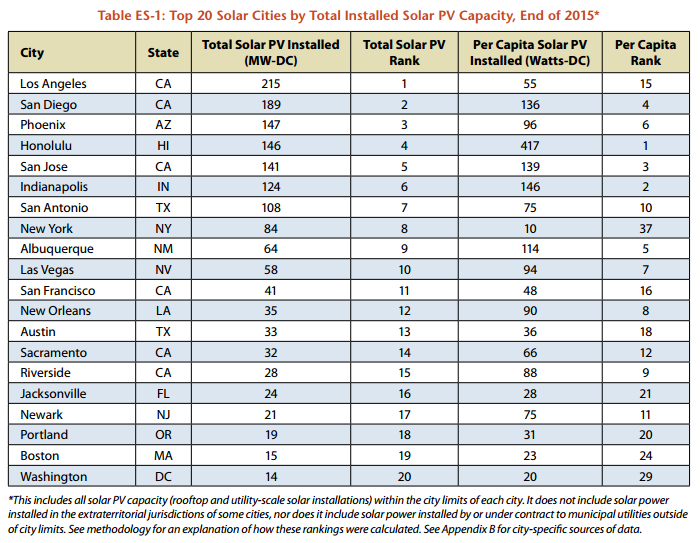 San Antonio, despite being in one of the most conservative states, came in 7th place in the Shining Cities report for “Total Installed Solar PV Capacity,” following behind Los Angeles, San Diego, and Phoenix to name a few. The innovative approach CPS Energy – San Antonio’s municipally owned utility and the largest of its kind in the U.S. – has taken to provide clean electricity to its residents seems to be paying off. CPS used to compensate rooftop solar owners for their excess electricity through a traditional net metering model. However, structural and financial barriers prompted the utility to launch a solar leasing program called SolarHost, in which homeowners receive a credit on their monthly electricity bills of 3 cents per kilowatt-hour for simply hosting solar panels on their roofs. In the first three days after the announcement of this program, more than two thousand people applied – as many people as had installed rooftop solar in the past seven years. The Alamo City currently has 108 MW of installed solar PV, but has the potential to accommodate more than 6,000 MW on city rooftops. With this new and innovative alternative to net metering, reaching that potential seems highly likely. Austin fell shortly behind San Antonio in the Shining Cities report, in 13th place with 33 MW of solar PV installed within the city limits. However, this number does not account for the solar power generated by the 35-MW Webberville Solar Farm just outside the city’s limits, which supplies solar energy to Austin through a PPA with Austin Energy. This solar farm generates enough electricity to power 5,000 homes a year. Austin is on track to become even more of a solar leader and meet its goal of generating 55 percent of its energy from renewables by 2025 with 450 MW of additional operating solar capacity in the development pipeline. This is in part due to Austin Energy’s Value of Solar (VOS) tariff, another policy alternative to net energy metering wherein the customer purchases energy at the utility’s retail rate and is compensated for solar PV generation at a separate VOS rate of 10.9 cents per kilowatt-hour. This separation of electricity generated by the consumer and the electricity consumed allows Austin Energy to better understand customer volume, timing, and load, which in turn provides the customer with more accurate, area-specific compensation. Market interest and discussion of VOS tariffs are increasing, especially as Austin Energy continues to prove this alternative works. By adopting smart policy – like attractive financing options, easy and streamlined installations, fair compensation for homeowners supplying energy to the grid, and a strong commitment to support solar energy development – more Texas cities have the potential to shine. Texas has some of the most solar potential in the U.S., due in large part to the fact that it offers customers the lowest average cost for solar on a per-watt basis. The average gross cost difference for a solar energy system is significant: $3.21 per watt compared to the national average of $3.69 per watt. But this potential is hindered, not only due to low natural gas prices, but also the lack of utility rate options for solar in the deregulated market. San Antonio and Austin have designated themselves as solar leaders by adopting policies and rate structures that strive to maximize the benefits of solar energy to consumers. Instead of resisting the spread of rooftop solar like some cities in Texas, these municipal utilities have found a way to promote distributed solar in their service area without losing any customers and even expanding their customer base to people at all income levels. Houston, Dallas, and Ft. Worth – Texas’ other big urban centers – may never compete with Los Angeles or sunny San Diego when it comes to solar capacity. But by adopting smart policy – like attractive financing options, easy and streamlined installations, fair compensation for homeowners supplying energy to the grid, and a strong commitment to support solar energy development – these cities, too, have the potential to shine. 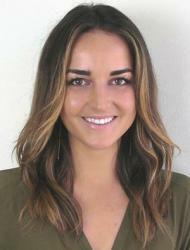 This entry was posted in California, Electricity Pricing, Solar Energy, Texas, Utility Business Models. Bookmark the permalink. Both comments and trackbacks are currently closed. Great article and absolutely agree that smart policies will guides consumers and the invisible hand alike toward sustainable choices. 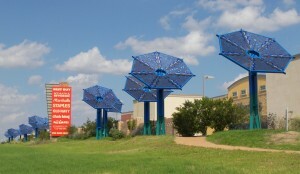 I am also very happy to see the Austin Sunflowers featured in this article. These modules were manufactured in 2008 & 2009. I was the principle developer on the manufacturers’ side for those modules and enjoyed working closely with the Texas Solar Power Company http://www.txspc.com/gallery.php and Austin Energy to get them approved for installation. It was a true collaboration of art, community and technology. Go Austin! Tom — your comment is much appreciated, as is your great work on the Austin Sunflowers!